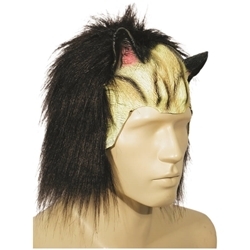 This cat headpiece is a great way to create the look of a cat. The headpiece is made of rubber and has attached ears and hair that covers your natural hair. This headpiece can also be used for anime characters and comicons. The cat headpiece is colored as pictured and is one size fits most up to a 23" head measurement.